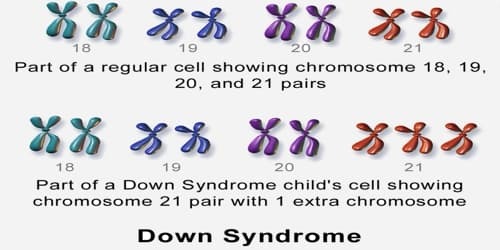 Definition: Down syndrome (DS or DNS), also known as trisomy 21, is a genetic disorder caused when abnormal cell division results in an extra full or partial copy of chromosome 21. It is typically associated with physical growth delays, mild to moderate intellectual disability, and characteristic facial features. The average IQ of a young adult with Down syndrome is 50, equivalent to the mental ability of an 8 or 9-year-old child, but this can vary widely. Normally there are two copies of every chromosome. In Down syndrome, there are three copies, either complete or partial, of chromosome 21. The characteristics of Down syndrome include low muscle tone, short stature, flat nasal bridge, and a protruding tongue. 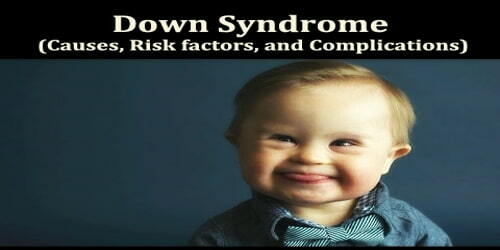 Individuals with Down syndrome have a higher risk of some diseases including Alzheimer’s disease and epilepsy. The parents of the affected individual are typically genetically normal. The probability increases from less than 0.1% in 20-year-old mothers to 3% in those age 45. Down syndrome can be identified during pregnancy by prenatal screening followed by diagnostic testing or after birth by direct observation and genetic testing. There is no cure for Down syndrome. Many of the disabilities are lifelong, and they can also shorten life expectancy. Education and proper care have been shown to improve quality of life. However, people with Down syndrome can live healthy and fulfilling lives. Recent medical advances, as well as cultural and institutional support for people with Down syndrome and their families, provides many opportunities to help overcome the challenges of this condition. 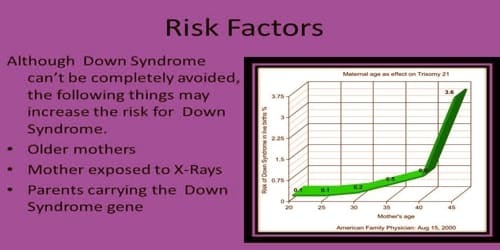 Causes and Risk factors of Down syndrome: Down syndrome happens when there is an extra copy of genetic material on all or part of the 21st chromosome. Trisomy 21 – Trisomy 21 means there’s an extra copy of chromosome 21 in every cell. This is the most common form of Down syndrome. Mosaic Down syndrome – Mosaicism occurs when a child is born with an extra chromosome in some but not all of their cells. People with mosaic Down syndrome tend to have fewer symptoms than those with trisomy 21. Translocation Down syndrome – It occurs when part of chromosome 21 breaks off during cell division and attaches to another chromosome, usually chromosome 14. The presence of this extra part of chromosome 21 causes some Down syndrome characteristics. Down syndrome is one of the most common chromosome abnormalities in humans. It occurs in about one per 1,000 babies born each year. According to the Centers for Disease and Prevention, mothers aged 35 and older are more likely to have a baby with Down syndrome than younger mothers. The risk increases the older the mother is. It’s important to remember that no one of these factors means that people will definitely have a baby with Down syndrome. However, statistically and over a large population, they can put them at higher risk. Like anyone else, people with Down syndrome need friendships and relationships. Some will live with a partner or get married and have an independent life. However, it is worth bearing in mind that if one partner has Down syndrome, there is a 30 to 50 percent chance that any children will too.